The following books and information sources are felt to be the most reliable regarding the history of the Cockermouth, Keswick and Penrith Railway. Some also look to the future. The books listed here are not available through CKP Railways plc or Iceni Enterprises Ltd. Please consult your local bookshop. Published by Oakwood Press in 2001, has been extensively revised. A review in the R&CHS Journal states that it is about as definitive a history as one is likely to get. Unfortunately, Oakwood Press books are not currently available from us. Selected bookshops stock the full range as available. 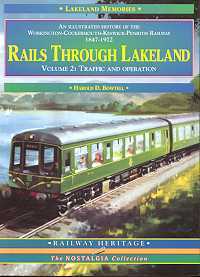 "Rails through Lakeland" by Harold Bowtell. Originally published as a single volume hardback, then reprinted in two voulmes as softbacks. Neither version seems to be currently in print, but may be available through bookshops. Rails Through Lakeland: Volume 2: Traffic and Operation. 160 printed pages with black and white photographs. A detailed study of the company's locomotive and rolling-stock operations, also looks at the stations and bridges, signalling etc. Suggestions for inclusion on this page are always welcome.